Provide comfort for the family of Mary Conti with a meaningful gesture of sympathy. 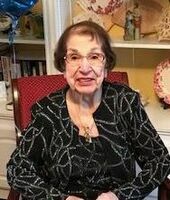 CHELMSFORD- Mary (Barossi) Conti of Chelmsford and formerly of Revere, joined the Lord on Wednesday, April 10, 2019, at the age of 101. Mary was the beloved wife of the late Angelo Conti who passed away in 1981. Born in South Boston on November 23, 1917, she was a daughter of the late Guido and Jennie (Bucchieri) Barossi of South Boston. She will be dearly missed by her daughter, Margaret Marshall of Chelmsford who was her physical and spiritual caregiver for eight years. Mary graduated from Boston Teachers College (UMASS Boston Alumni Association) with a Bachelor's degree in 1939 and a Master's degree in education in 1940. She was a professional typist of Doctorates and Thesis and retired as a typing and business teacher at Revere High School in 1980. Mary held membership in the Revere Teacher's Association, was past President of the Friends of the Chelmsford Senior Center and was a board member for many years. She spent nineteen years as a trip group leader and coordinator for the senior center. Mary was also a faithful communicant of St. Mary Parish in Chelmsford. In addition to her daughter, Mary is survived by her son-in-law, Theodore Scholl of Wichita, Kansas; two grandchildren, Jennifer Cook of St. Augustine, FL and Christopher Cook Sr. and his wife, Denise (Turner) of Billerica; three great grandchildren, Christopher, Jr., Elizabeth and Abigail Mary Cook all of Billerica; also four step-grandchildren and three step great grandchildren; three Godchildren, Mary Eskrels, Anne Fulginiti-Davidson and John Fulginiti; several nieces and nephews; and many dear friends from the Chelmsford Senior Center. She was predeceased by her daughter Jean (Cook) Scholl, her son-in-law, John Marshall, her sister, Agrippina Rossi and her brother, Salvatore Barossi. Visitation will be held on Monday from 4:00PM until 7:00 PM in the Blake Chelmsford Funeral Home, 24 Worthen Street, Chelmsford. Her Funeral Mass will be celebrated on Tuesday at 11:00 AM in St. Mary Parish, 25 North Road, Chelmsford. KINDLY MEET AT THE CHURCH. Interment will follow at 1:00 PM in Holy Cross Cemetery, Malden. For those who wish, donations in loving memory of Mary can be made to: The Friends of the Senior Center, Inc., 75 Groton Rd, North Chelmsford, MA 01863 or to: St. Mary Parish, 25 North Road, Chelmsford, MA 01824. To plant a memorial tree in honor of Mary Conti (Barossi), please visit our Heartfelt Sympathies Store.